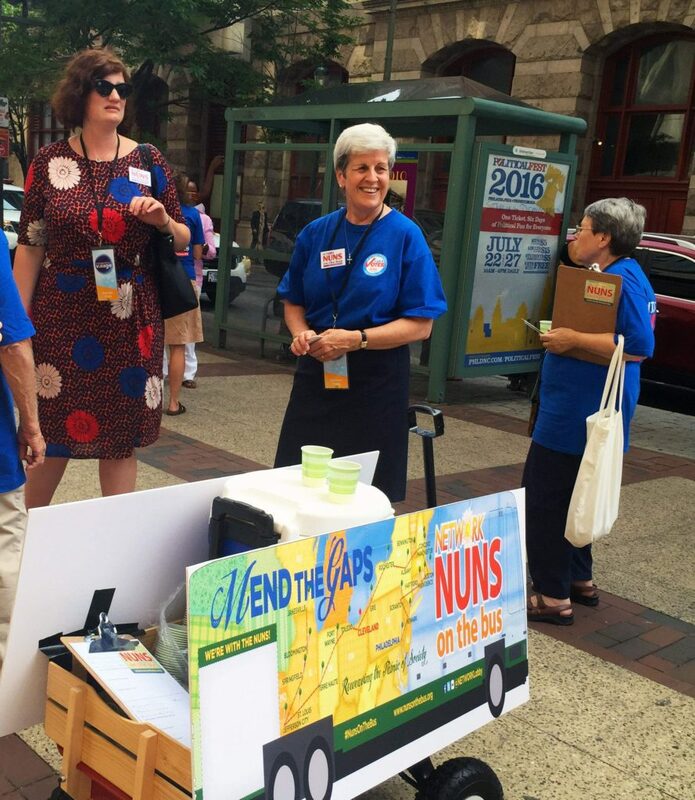 PHILADELPHIA — Just when I had written off the idea of finding Iowans volunteering with one of the advocacy groups in town for the Democratic National Convention, a group of wagon-pulling nuns rolled up and offered a cup of lemonade. Needing to meet a deadline and in a hurry, I initially refused. The nuns persisted. They were sweet and kind, so I snapped a photo to post on Twitter with my thanks. But when I tried to post it, the only group with the “Nuns on the Bus” name I found was based in Ohio. “Is this organization out of Ohio?” I asked. Some days, I guess, that’s how it works. The moment you stop running around, trying desperately to make things happen, the very thing you wanted appears on a hot sidewalk pulling a wagon of cold lemonade. 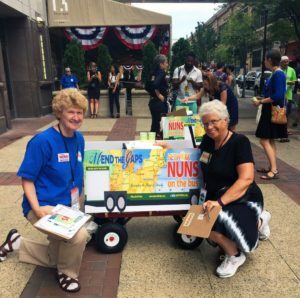 Sisters Marge Clark BVM and Richelle Friedman PBVM are part of the Dubuque community, although both now work as lobbyists in Washington, D.C.
Clark lobbies on behalf of Network, which was founded by Catholic sisters in the progressive spirit of Vatican II. She also taught at Dubuque’s Clarke University from 1985 to 2003. Friedman, a native of Farley, is director of public policy for the Coalition on Human Needs. From 1980 to 1989, however, she taught math and religion classes at Regis High School in Cedar Rapids. 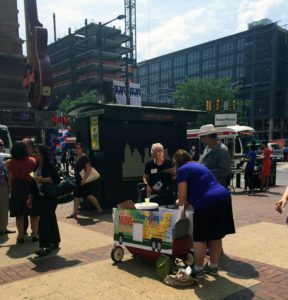 The two were on the sidewalk to hand out lemonade and talk to passers-by about “mending the gaps” and “reweaving the fabric of society.” That’s a more fancy way of saying the group wants to level the economic playing field in terms of taxes, wages, housing, health care and democracy. They offer informational brochures with an attached pledge card. Although Friedman and Clark won’t be on the entire tour, the group has planned to travel across 15 states. At the DNC, and earlier this month at the Republican Convention, they offered educational sessions to delegates and others. Many times, however, the bus stops at organized rallies. When that happens, Friedman says she just wants to send it right back to the crowd. The sisters say they are grateful to everyone who is out there, doing what they can to make the world better.